Want to know how the Worcester County real estate market is doing? 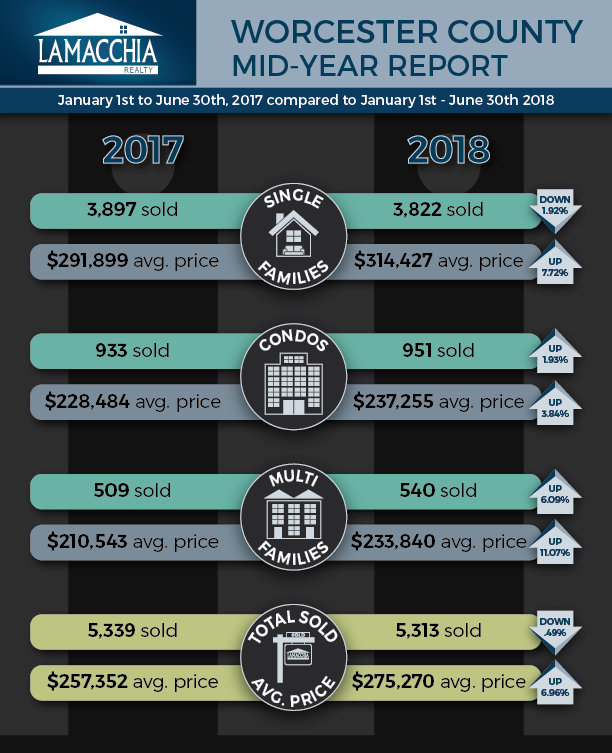 In this Mid-Year Report, we’re looking at home sales in Worcester County for the first half of 2017 versus the first half of 2018 and how the market is currently performing. As of June 30th, a total of 5,313 homes sold in Worcester County at an average sale price of $275,352. These numbers include single-family homes, condominiums, and multi-family sales combined. The number of homes sold is down by half a percent from this same time period in 2017 when 5,339 total homes were sold. Prices are up 6.96% from $257,352 in 2017. From January 1st to June 30th, there were 7,867 homes listed on the market, up 1.65% compared to 7,739 within the same date range in 2017. From January 1st to June 30th, there were 6,711 homes that went pending (contracts accepted), down 1.74% compared to 6,830 within the same date range in 2017. The Worcester County market has performed steadily in the first half of 2018 when considering the overall performance of the Massachusetts market, as shown in our 2018 Mid-Year Report. Sales were basically flatlined from last year and price increased which is a strong outcome with inventory what it’s been over the past 6 months. We should see a similar performance over the rest of the summer and into the fall.